The untold truth of how college hurts the poor and doesn’t help the wealthy, and how new, innovative colleges arethe solution. 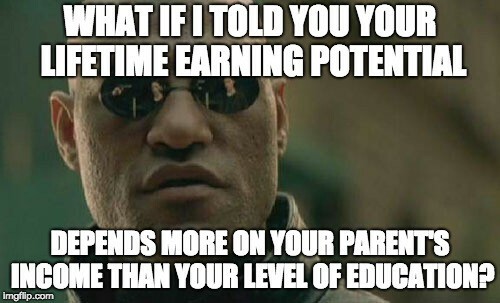 As a society, we’re being lied to about the value of a college degree, and the lie hinges on the phase “Expected Lifetime Earnings”. Expected Lifetime Earnings means the amount of money you can expect to make over your whole life. 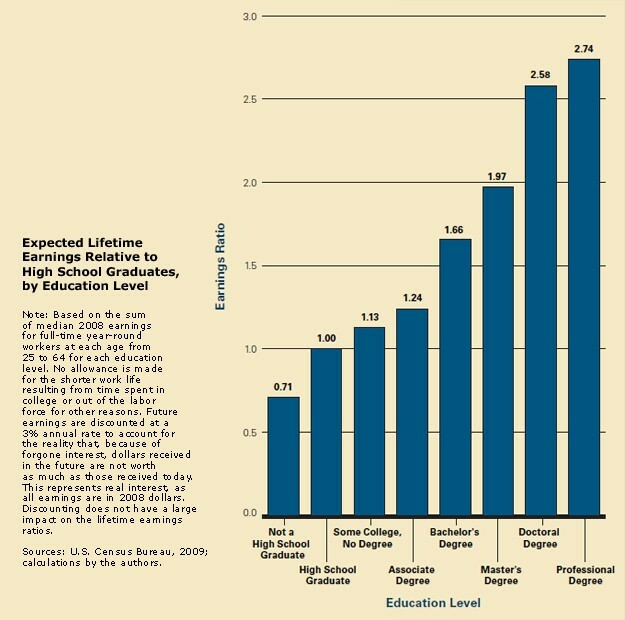 Currently we are told that people with higher level of educational attainment have a higher expected lifetime earnings. And this is 100% true. Someone who doesn’t finish high school is expected to make only $710,000 over their life, while someone with a doctoral or professional degree is expected to make about 4 times that much (around $2,750,000). Most people read this, and are encouraged by experts and education wonks to read this information as meaning “more education = higher income”. But that is a statistical fallacy or, as its called where I come from in the heartland: a lie. This data only proves a correlation between higher education and greater income, not causation. If we want to find out what really is the cause of higher income, we need to examine any confounding influences in the data. For example, the wealth of the people as they enter college. As it turns out, if you normalize for family wealth, the value of higher education flattens out. This doesn’t mean that learning is not valuable, learning is more valuable than ever! What it means is the current system of higher education doesn’t educate people in the right topics, in the right ways, at the right speeds. A growing body of social science and journalistic research is showing that college, as it is currently designed, is a kind of 4 year holding pen. The children of high income parents and families can afford to waste 4 years of their life to get a political science degree. After they get out of college their privileged upbringing, connections, and wealth keep them buoyed up. But the poor cannot afford to waste 4 years of their lives so they either don’t go or shouldn’t go to college as it is currently designed. In a recent groundbreaking expose in the New York Times, journalists showed that even how we judge “good colleges” is largely caused by the wealth of people who go there, not the school’s efficacy in training its students. But What About the Information Economy? But isn’t our economy becoming more and more advanced and the workers in it need more and more knowledge to succeed? People don’t need less higher education, they need more! The current system of higher education, however, is not respond to changes in the economy or labor force and is actually built to be insulated against them. For proof of this look at these two graphics. They show that the majors and degrees people are getting do not prepare them for the jobs they finally work in. 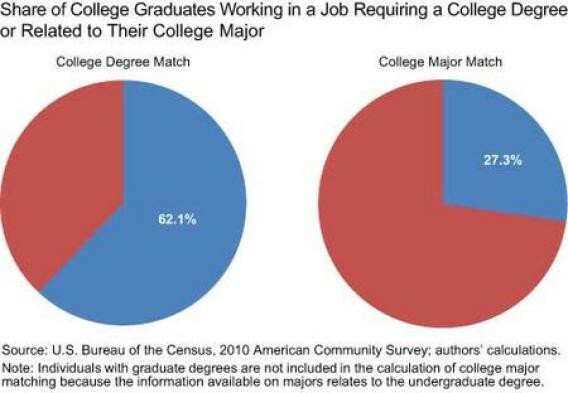 That means that in a supermajority of cases people are not learning anything useful to their job readiness in college. As Anthony Carnevale the director of Georgetown University’s Center for Education and the Workforce says: “[Higher education] is a system that largely operates on reputation and prestige, which has little to do with the ultimate value of the courses you take”. The only majors that actually train people in skills that the economy needs is engineering, mathematics, and some finance and marketing. The rest of college is pretty much, again, a holding pen. Higher education needs to be accountable to their students. Currently private and public colleges alike are wilding unaccountable. It doesn’t matter if the accountability comes from the government or the market, but we need one or the other. Currently we have neither. Universities are shielded from market pressures by receiving billions in federal funding and tax breaks, but there is also no federal agency that is reviewing colleges and their performance. So all that money has virtually no strings attached. Competition— Allow new, innovative colleges to start and compete with old, traditional ones. Give Regulators Teeth — Add more strings to federal funding to be more accountable to students or responsive to the economy. A great education is worth more than ever. American colleges, public and private, are virtually unaccountable to their students and society. The solution is to add new colleges, smarter financing, and more regulators to make old colleges more accountable. What you can do is be aware of alternative colleges and alternatives to college and share them with your friends and family who are looking for more education. Educator, Founder, Engineer. Interested in Educational Research, Cities, Economics, Buddhism, Basic Income, and Fiction.